I started Crossfit two years ago to supplement my running workouts. I met Umo and James through Crossfit and I was impressed by their wealth of knowledge about fitness and nutrition and also by how down to earth and approachable they are. 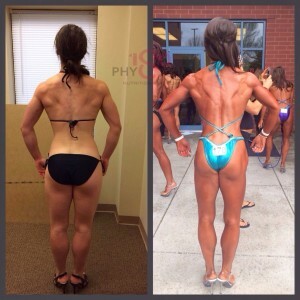 I started working with 180Physique to prepare for my first figure competition. They helped me with meal plans, posing, workouts and advice for the competition and I cannot say enough good things about working with them. There are so many facets to being prepared for a physique competition and so much time and work goes into prep working with someone who had knowledge and experience allowed me to get the most out of my prep. Proper nutrition was a huge component of my success in the figure competitions and that carried over into other aspects of my life. Almost immediately after starting my meal plan I saw huge improvements in my performance at the gym, my energy levels and how my body looked. Umo spelled out my eating plans very clearly, checked up on me a lot and was always available when I had questions. I also appreciated how the nutrition methods used for show prep are scientifically based and centered on the health of the competitor. The process of competing was hard work to say the least, but Umo and James were helpful and encouraging the entire time. All the meal plans, workouts, posing and advice paid off, because I am now an IFPA Figure Pro! I can’t wait to see where I go from here and I look forward to working with 180Physique in the future.